I am a JSPS International Research fellow working in Kyoto University (Department of Astronomy). My research interests lie in the field of galaxy formation and evolution, with a particular focus on the active galactic nuclei (AGN) with supermassive black holes (SMBH) using ground optical telescopes as well as space-based high-energy X-ray instruments. I received my Bachelor of Science degree in Astronomy from Yonsei University (South Korea) in 2008, with GPA of 3.92 (out of 4.3). I continued studies and enrolled Combined Masters and PhD courses in the same university from 2008 (supervisor: Prof. Sukyoung K. Yi). I was awarded ‘the Swiss Government Excellence Scholarship’ at the academic year of 2013 and 2014. I received PhD degree in 2015 February with a thesis titled ‘Improving Spectral Line Strength Measurements of SDSS Galaxies and the Demographics of Nearby Broad-Line Region Active Galaxies’. With this thesis, I was awarded the best thesis prize from the Graduate School of Yonsei University. I started referee service to the Astrophysical Journal since 2015. Previously, I have worked at the Institute for Astronomy (ETH Zurich, Switzerland) as a postdoctoral researcher in the Black Hole Research Group led by Prof. Kevin Schawinski. 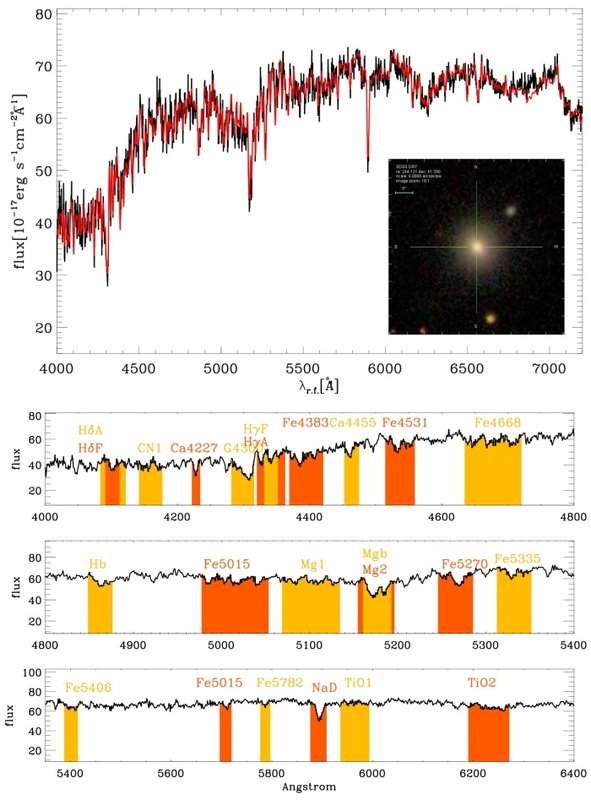 Spectroscopic data provides a fossil record of galaxies featuring stellar absorption and nebular emission lines, both of which have been studied extensively over the past several decades. Since William Hyde Wollaston first observed and noted sunlight passing through a prism in 1802 to reveal a rich spectrum, spectral lines have been used to understand the physical processes governing the evolution of galaxies. The prominent stellar absorption features seen in galaxy spectra give us the average surface gravities, effective temperatures, metal abundances, and kinematics of their stellar components. In order to measure the strength of various stellar absorption lines to compare them across different objects and facilitate the prediction of theoretical models, we require a common system of integrated light spectroscopy, the most prominent of which is the Lick/IDS system. Top: Example spectral energy distribution of elliptical galaxy (SDSS) with gri-composite image. Bottom 3 panels: Prominent absorption lines are shown with colour shades. Nebular emission lines, on the other hand, probe the physical state of the ionized gas in galaxies and thus can be used to trace the nuclear activity of central supermassive black holes (SMBHs), or their instantaneous star formation rate. 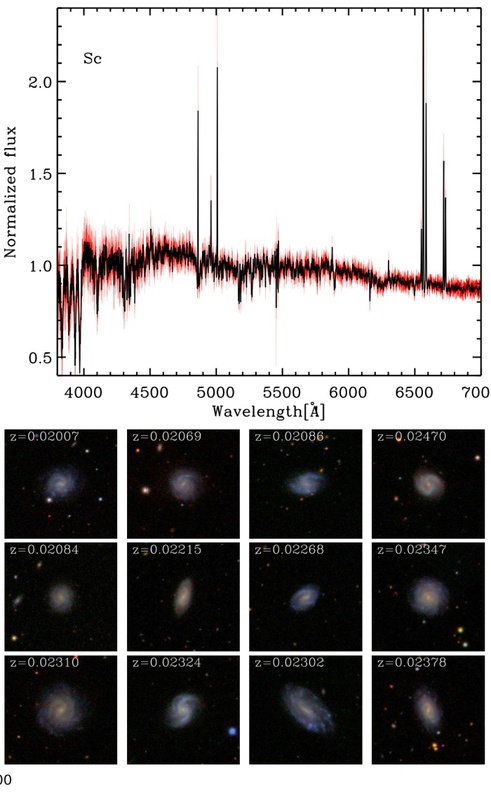 Emission line ratios have been turned into powerful diagnostic tools, not just for individual galaxies, but for massive spectroscopic surveys. In comparison to star forming regions, active galactic nuclei (AGN) are assumed to produce photons with higher energy and, therefore, are more effective at producing extended partially ionized regions and inducing collisional excitations. These results lead to higher ratios of the collisionally-excited forbidden lines over the photoionization-induced Balmer emission lines. The idea has been confirmed further, and now even finer classifications of the AGN, such as Seyferts and low-ionization nuclear emission line regions (LINERs), are often attempted. Top: Example spectral energy distribution of spiral galaxy (SDSS, Sc type). Prominent emission lines are presented. Black is observed SED and red is averaged fit. Bottom 12 panels: Composite images of spiral galaxies that used to make the red SED shown in top panel. A SMBH that is 10^4 to 10^9 times as massive as our Sun is located at the innermost part of galaxy. Matter, gas, and dust that are close enough to the central SMBH fall into the center by gravitational force. The accretion of matter with spiraling motion loses its angular momentum and releases an enormous amount of energy. These SMBH with accreting matters are referred to as AGN. The energy released by the accretion produces characteristic spectral features across the electromagnetic spectrum. The first record of an AGN goes back to the early 20th century. E.A. Fath at Lick Observatory obtained optical spectrum of NGC 1068 and noted the presence of strong nebular emission lines in 1908. Later, Carl Seyfert (1943) found several galaxies similar to NGC 1068, showing bright nucleus with strong emission lines (NGC 1275, NGC 3516, NGC 4051, NGC 4151, and NGC 7469). NGC 3516 and NGC 7469 revealed broader hydrogen lines (8500 km s^-1 of full width at zero intensity) than other lines by Doppler motion. The spectral energy distribution (SED) of AGN in optical band, as we have seen in the pioneering optical spectroscopic studies, is characterized by ionized emission lines. In consequence, two sub-classes, type 1 and type 2 AGN, were established based on the emission line profiles. Type 2 AGN (often called as Seyfert 2 galaxies) show only narrow permitted lines and forbidden lines with several hundred km s^-1 typical full-width at half-maximum (FWHM). These narrow emission lines are generated under the low gas density environment (ne ≃ 10^3–10^6 cm^-3) that is spatially extended and comprises the so called narrow-line regions (NLR). In contrast, broad permitted lines, which show up to several thousand km s^-1 of FWHM are produced at high gas density regions (ne > 10^9 cm^-3). Throughout the high gas density regions, the electron density is much higher than the critical density for collisional de-excitation. Naturally, certain metastable states and the corresponding manifestation of forbidden lines that are conspicuous in NLR, are suppressed, which leads to absence of broadened forbidden lines in optical type 1 AGN spectra. Schematic illustration of the unified AGN model (K. Oh, PhD thesis). The differential gas density distribution of BLR and NLR gives us a clue for understanding the structure of AGN. From the center of the nucleus to the exterior, there is a black hole and hot accretion disk with a few light days of scales. Then BLR clouds, which are increasingly rapid the closer they are to the center of system, emit broad permitted lines under the high gas density environment. The obscuring medium, which is also called the dust torus, besieges them with a few parsec scales. Since the dusty torus is optically thick, the broad permitted lines from the BLR clouds cannot be observed at a certain opening angle. In other words, different viewing angles to the center of the sources give rise to different observational results based on the same origin of light source. Further away from the dust torus, NLR clouds emit narrow emission lines with a few hundreds parsec scales. Beyond all these structures, radio jets are observed oriented perpendicular to the accretion disk with Mpc scales. This is the so-called unified AGN model, which is widely accepted in current astrophysics. The Burst Alert Telescope (BAT) instrument on the Swift satellite has surveyed the sky to unprecedented depth, increasing the all sky hard X-ray sensitivity by a factor of more than 20 compared to previous satellites. The goal of the BAT AGN Spectroscopic Survey (BASS) is to complete the first large (>1000) survey of hard X-ray selected AGN with optical spectroscopy. BASS will place constraints on the growth and structure around nearby black holes and provide a baseline for future European X-ray missions, such as ATHENA, that will perform deeper observations of more distant AGN. The goal of the BASS sample is to obtain emission line measurements, black hole masses, and high-quality X-ray observations for a large sample (>1000) of the brightest and most powerful hard X-ray selected AGN (>10 keV) on the sky. The hard X-ray selection ensures a sample that includes both unobscured and the dusty and heavily obscured AGN that are only found in the high energy X-rays (>10 keV). In the first data release, we use the largest available optical spectroscopic sample of Swift BAT sources using dedicated observations and public archival data for a sample of 641 unique AGN with spectra (Data Release 1) that are flux and wavelength calibrated and the spectral resolution was well determined. Click this banner to visit www.bass-survey.com : see more detail and get full data!